Congratulations to Deanna Adams – what next for this extroadinary cyclist? Deanna was introduced to mountain biking at high school. The area she lived in was perfect for this sport and she quickly began to race competitively. It was not long before she was looking for greater challenges. In August 2007 she entered her first road race cycle event – the 200 mile ‘Desperado Dual’. This race is located in the center of Utah’s Color Country and follows a spectacular route through the heart of the old west. 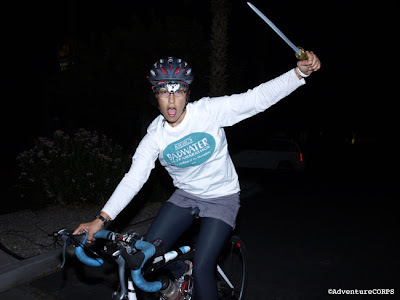 It was after this event that her passion for ultra endurance events began and her sights were soon set on the upcoming Furnace Creek 508. Furnace Creek 508 is a road bike race which has a 48-hour time limit. Known as, “The Toughest 48 hours in Sport,” the 508 follows roads North from Santa Clarita, CA through the heart of the Mojave Desert and Death Valley, with 35,000ft total elevation, to a very distant finish in the small town of Twentynine Palms, CA. However, all these races come at more than the physical cost. They do of course cost money. To help save money Deanna moved back into her parents home in Arizona and got a job at Walmarts and started saving for a bike, gear, entry fees, and the costs associated with participating in races: van rental, food, lodging for herself and crew, etc. Then followed a spate of races. October 2007 was Furnace Creek 508 for which she got a DNF (did not finish). However, Deanna was pleased with her achievement of 426 miles – the furthest she’d ever cycled in one go, and that done whilst coping with hallucinations and extreme dizziness. It is worth remembering that the 508 is a grueling two-day affair in Death Valley which pits riders against other racers, themselves, and mother nature as they find themselves riding through hundreds of miles of heat, exhaustion, and darkness – it is necessary to ride much of the race at night. 8 months later she did the first ever Race Across the West which is 1,032 miles of the Race Across America. She did 821 miles in 88 hours to Durango, CO where she crashed and got a concussion. Then the next month Deanna did the Race Across Oregon, but was stung by a bee which caused so much pain to her Achilles tendon that she had to pull out at 275 miles in 23 hours. And what greater challenge than the Great Continental Divide Race between Banff, Canada and Antelope Wells, New Mexico? At a mere 2,745 miles, the Tour Divide, or The Great Divide MTB route, is a solo, self-supported mountain bike race with an average time-to-completion of three weeks in the saddle. The rider is responsible for finding their own food, water, and place to sleep each day. It is 2,745 miles of rain, snow, mud, huge head winds, intense heat, animal encounters, drunk driver run ins, etc. It is viewed as the hardest self-supported mountain bike race possible. The start day for this race was 12th June, at 10.00 a.m in Banff. Deanna crossed the finish line in Antelope Wells, New Mexico at 5.30p.m. on 13th July. All this and Deanna Adams is just 20 years old, a fierce vegan and an epileptic. She wants to send the message that having epilepsy shouldn’t hold you back from fulfilling your goals and dreams. The wrist band she wears sums up her outlook on life that “Doubt Kills Dreams”. These “Doubt Kills Dreams” wrist bands were made as an on-going attempt to raise money so that she can have the means to participate in races.